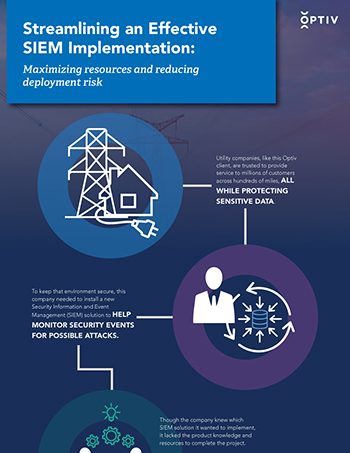 While addressing ways to further secure their environment and protect sensitive customer information, a large utility company saw a need to install a new Security Information and Event Management (SIEM) solution to help monitor security events for possible attacks. Because this was a large investment, the company needed a trusted partner like Optiv, which has extensive SIEM experience, to effectively complete the implementation. Learn how they completed a successful SIEM implementation with Optiv. Follow their steps in this infographic.